Six years ago, my husband Tyler and I built the house we'll never move from and proceeded to plan the yard of our dreams. It has, however, been what you might call a "work in progress" kind of situation ever since. The first year, we got a landscaper in but it was a new operation, the team was smaller than they anticipated, and my husband ended up helping to lay the sod so it wouldn't dry out. The second year, we realized the corner of our yard dipped lower than anyone had noticed and come spring, we had scraggly pine trees growing in a swamp. Ty and my dad also built a deck which, in the third year got stained-- a decision that we regretted in the forth year when that stain began to flake off like a bad sunburn. Year five was a time of reflection (easy to do in that pond-like corner) and by the end of the season, we'd formed a plan: rip out the treated-wood deck and pursue permanence with patio stones and cedar. Along the way, we learned about plants that thrive and die in Zone 3 growing conditions, hardy materials and the opposite, and that good lighting is everything. I've come to terms with a backyard goals checklist being never ending... but I'm also finally enjoying a functional, beautiful backyard. Here's a quick tour! Here's a wide view of my yard pre-pergola-curtains which, in my opinion, make the place feel a lot fancier. My husband disagrees, citing the annoyance of them blowing in your face, drink, and fire. WHO CARES THEY ARE GORGEOUS. Anyway, we bought this pie-shaped lot because we liked the idea of having zero work in front and lots of room in the back to play croquet, bocci ball, and catch. A major design must for me when we decided on paving stone was rounded stairs. 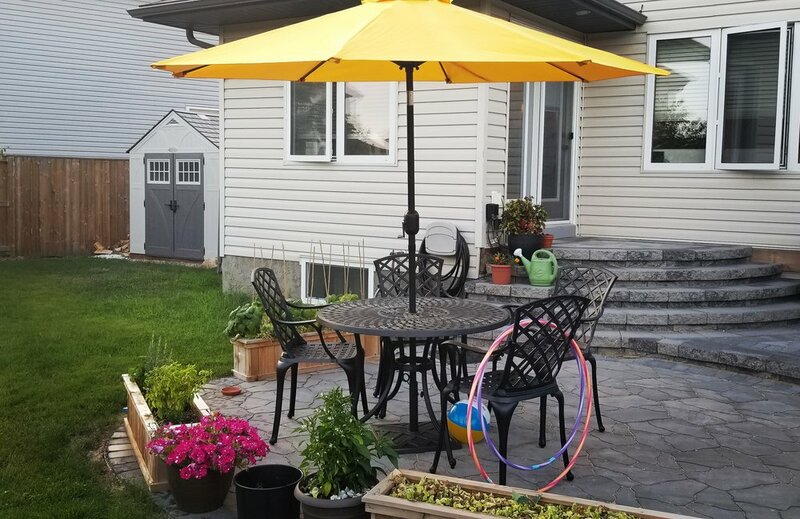 I illustrated an idea for the patio and pergola that Tyler and I had come up with and like magic, Mike and his team at Keystone Paving not only brought that little drawing to life but enhanced it with the suggestion of switching to flagstones on the ground level to add contrast. Those gents consulted me about design questions as they arose, listened to my feedback, and put their expertise to work for me. I'd confidently refer them to you if you live in Saskatoon. Okay, clearly I did not stage this picture and it's kind of dreary and junky but it's the only one I have that shows the cedar garden boxes that flank our little dining table. The lettuce was a little much thanks to someone's heavy plantin' fingers (Petra) but the herbs get daily use and the peas and beans did alright. Also, this reminds me: thanks to everyone on the Sneakers & Lipstick facebook page who voted for a yellow umbrella because it's perfect! Possibly I should outsource all decisions upon which I'm waffling. Underlit stairs were on our wish list not just because they look stunning but because it means no one's tripping up them if a get together runs late. These LEDs turn on when dusk hits and use nominal power. We've also got the creeping virginia underlit but as you can see, there's not a lot of creepin' happening yet! The patio is echoed in a circular pad around a fire pit where we have been enjoying marshmallow roasts as often as the season allows. Our Adirondack chairs are made from 100% recycled bottles, plus, they will last a lifetime. Kinda wish we would have bought the kid versions, too, but we already had these blue plastic ones from years prior. Sometimes, it's the little things you love the most. When my grandma moved to a condo from her home where my dad had grown up, she gave me her stepping stones, a few statues, her birdbath, and a few plants from her enviable flower beds and now that she's passed, they are all the more precious to me. Also pictured here is the amazing play structure my parents gifted to Petra and Paris. It sees the kids on it every day! I've said it before but I had no idea what a great investment these things are; that Petra can run out for a quick swing while I do dishes is fantastic. There are always flowers in bloom thanks to the planning done by Tyler and my dad be it peonies, lilies, hydrangea, or nine bark and my daughter enjoys playing florist with whatever is in season. Still on the list is to find a garden hose that will last a lifetime (PLEASE INVENT IT), and finding the perfect faux plants to pop into this chandelier fixture. I'd originally thought of doing real, trailing plants but oops, there's fire below! Also on the list is for things to grow taller. 😂 But in the mean time, I'm not complaining. 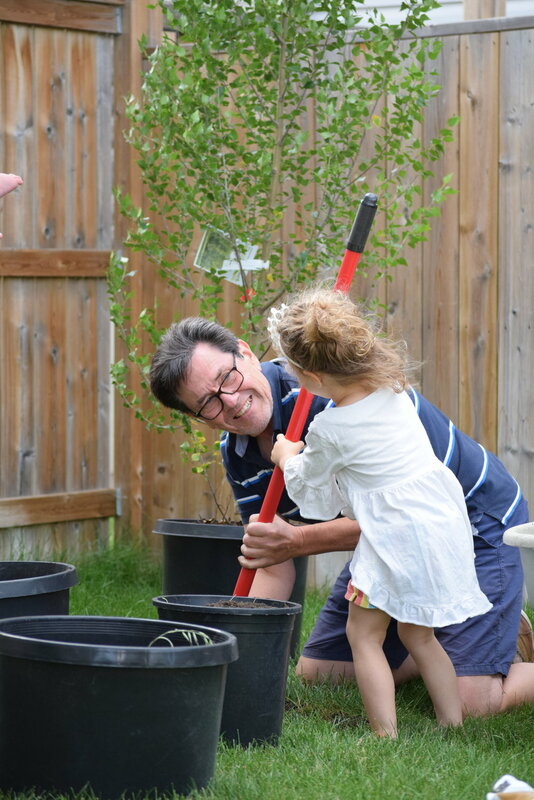 Fourteen trees and sixty shrubs later, we're still learning about what works best. Willows love a wet spring and dessert summers, a Russian Olive will bend but never break, and rose bushes require TLC that I'm not equipped to give. Tyler does a lot (mowing, balancing hot tub chemicals, pruning, watering... chores galore) but I also have to give thanks to my dad who helped to build the fence, makes countless Home Depot trips for us, plants and transplants, and often appears in the yard in the mornings, puttering away to help the backyard reach its goals.